The last week of October 1980 saw Marvel UK launch two new weekly anthologies: the fantasy-themed VALOUR and the SF-based FUTURE TENSE. - FT ran for 41 issues, weekly for the first 35 issues before switching to monthly for the final six months. 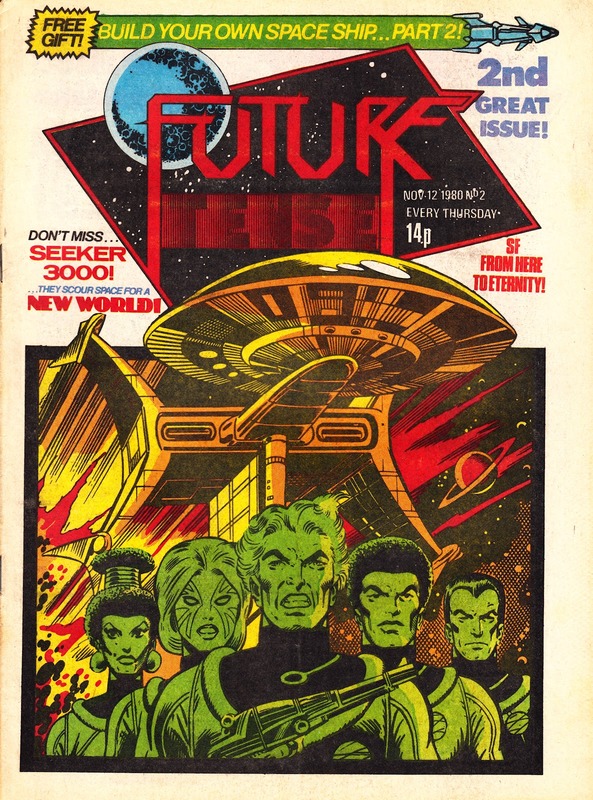 - 1980 had seen M-UK cut the frequency of two of its existing SF weeklies (DOCTOR WHO and THE EMPIRE STRIKES BACK) to monthly and its possible that FT was a hastily-conceived replacement intended to prevent a rival publisher squeezing an SF title onto the shelves. It's also possible that management anticipated the failure of one (or both) of the existing titles (Doctor Who, with its high origination budget seemed particularly vulnerable to closure in light of falling sales and the departure of its creator, Dez Skinn) and launched FT as a potential title to merge with. 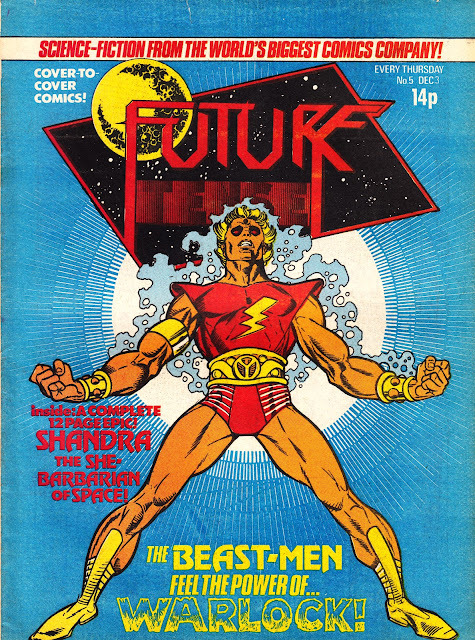 - FT continued to appear throughout 1981 (the last issue was published in December), a year where M-UK experienced an SF boom, publishing STAR HEROES POCKET BOOK (prior to being relaunched as X-MEN POCKET BOOK), DOCTOR WHO MONTHLY, THE EMPIRE STRIKES BACK MONTHLY and latterly BLAKE'S SEVEN MONTHLY. - FT, and Valour, were published in the "Skinn II" format: colour newsprint covers and black & white interiors. The monthly increased its interior page count and added a glossy cover (with a price increase to match). - In yet another example of M-UK running covers that don't match the contents, Nick Fury appears on the cover of issue one (recycled from US NICK FURY, AGENT OF S.H.I.E.LD 6) even through, bizarrely, he doesn't appear in the comic itself. 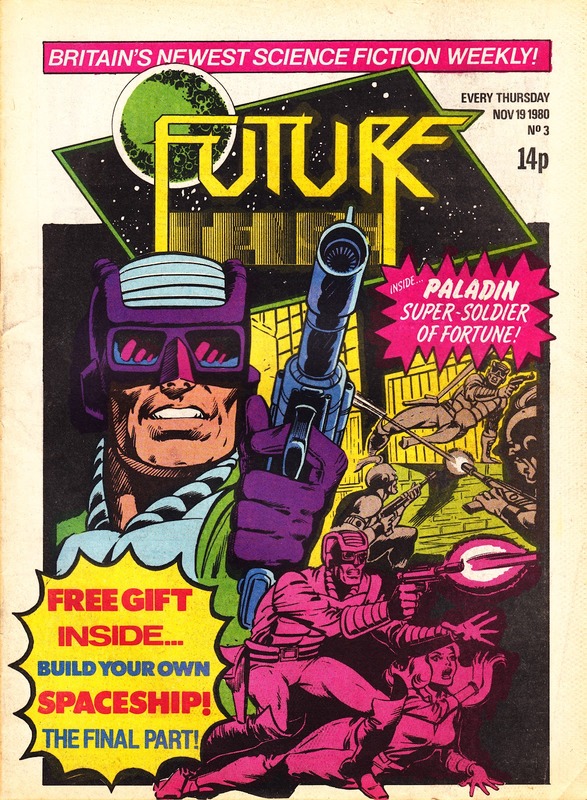 - The initial line-up was a job-lot of STAR WARS WEEKLY supporting features: Micronauts, Seeker 3000, Starlord, Star Trek wannabe Seeker 3000, Warlock and (odd-one-out) Paladin. Safe to say, none of these were stand-outs of the type needed to create a serious rival to 2000AD. - Seeker 3000, Paladin and Warlock all originated from the Marvel US try-out title MARVEL PREMIERE. - The free gift in the launch issues were a three-part cardboard "build your own spacesuit" model kit, loosely inserted into issues 1-3. - Issue 6 added Marvel's STAR TREK: THE MOTION PICTURE movie adaptation (replacing, predictably, the similarly starship-themed Seeker 3000), timed to coincide with the film's UK release. In the US, the adaptation appeared as a full colour one-shot Super Special and was serialised in the first three issues of Marvel's regular monthly Star Trek book. 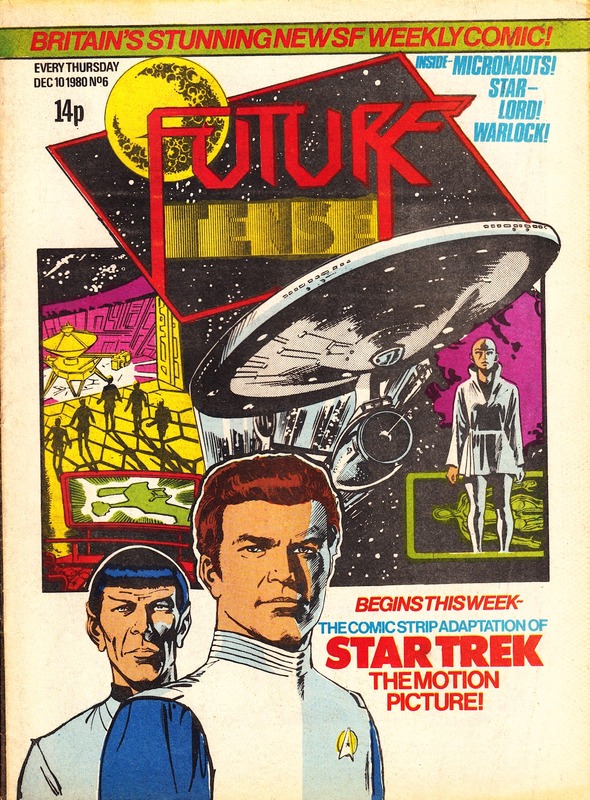 Trek would have been the obvious headline act for the launch issue (and the material had already been published in the States) so, perhaps, M-UK were contractually obliged to hold the material until closer to the movie premiere. In the UK, the adaptation also similtaniously appeared as an annual, for Christmas 1980. - ST: TMP was the underwhelming culmination of years of indecision by Paramount Pictures about the best way to revive the franchise. The healthy ratings secured by syndicated reruns (and the constant kerching of new merchandise) convinced the studio that the TV show had a future, they just weren't sure what. 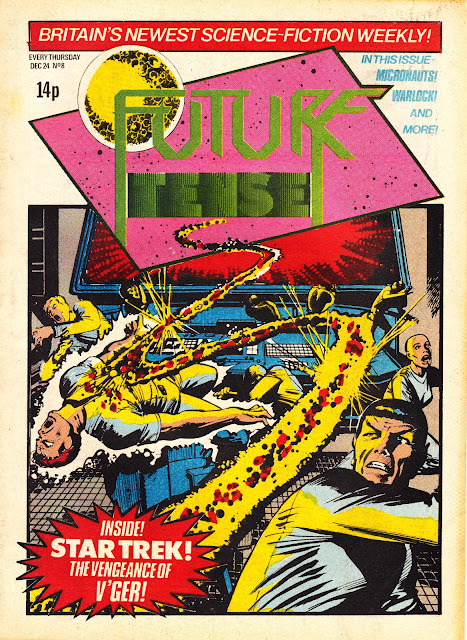 At one stage in the late seventies, Paramount hatched plans for a fourth TV network (pre-empting the launch of FOX by over a decade) with Trek as its centre-piece programme. The planned feature-length pilot episode, In Thy Image, was hastily reworked as ST:TMP (and the network plan abandoned) when the unexpected success of STAR WARS sent every Hollywood studio into the script vault looking for the next big SF flick. - Following the movie adaptation, FT predictably continued with reprints Marvel's post-movie original adventures. 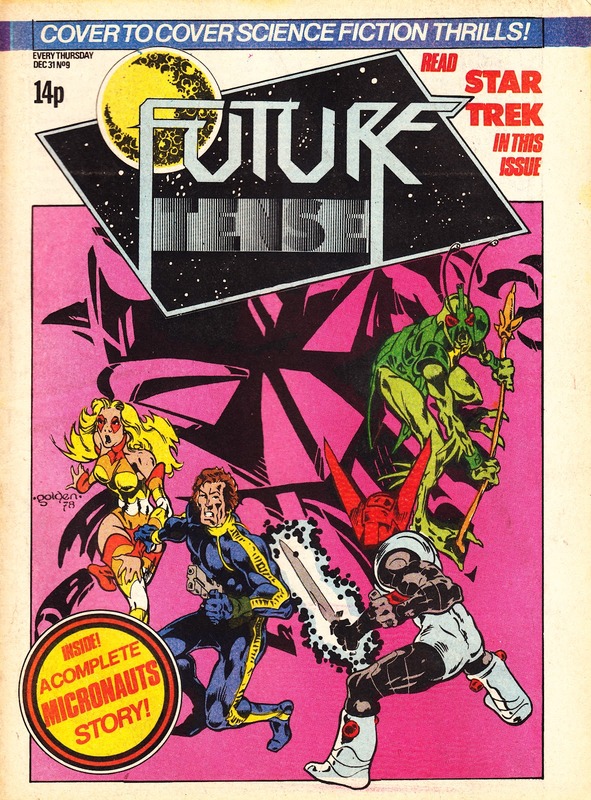 Marvel's deal with Paramount only allowed them to use Trek concepts featured in the film itself, leaving the rich history of the TV series off-limits. 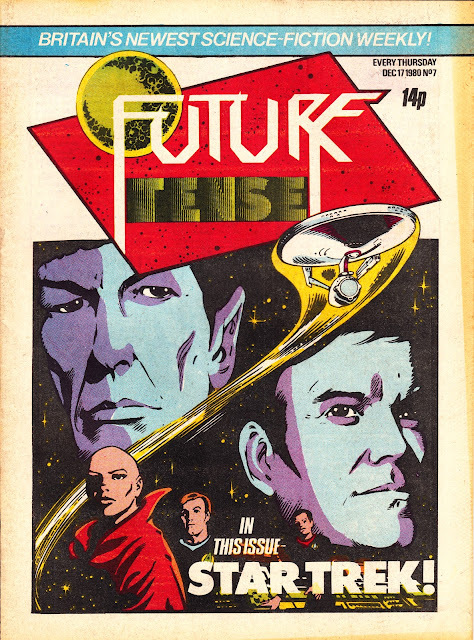 - M-UK renewed its association with the Star Trek franchise by, briefly, reprinting DC's adaptations (along with Starlog behind-the-scenes articles) of STAR TREK: THE NEXT GENERATION. - The Micronauts enjoyed a lengthy run across the British line, beginning with their debut as a back-up strip in STAR WARS WEEKLY. From there, they transferred to 1979's STAR HEROES WINTER SPECIAL (alongside Battlestar Galactica) followed by STAR HEROES POCKET BOOK in 1980 (again alongside Marvel's Battlestar strip). The cancellation of FT left them in limbo until THE MIGHTY WORLD OF MARVEL (volume 2) reprinted their four-part encounter with The X-Men. 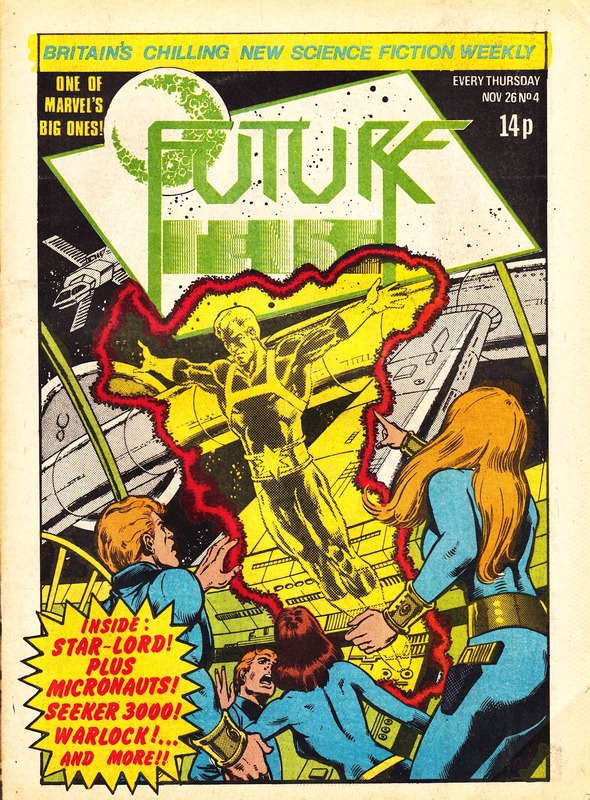 FT would be the last time the main Micronauts strip appeared in the UK. Their SECRET WARS II crossover chapters were also omitted (possibly for licensing reasons) from the UK reprints. 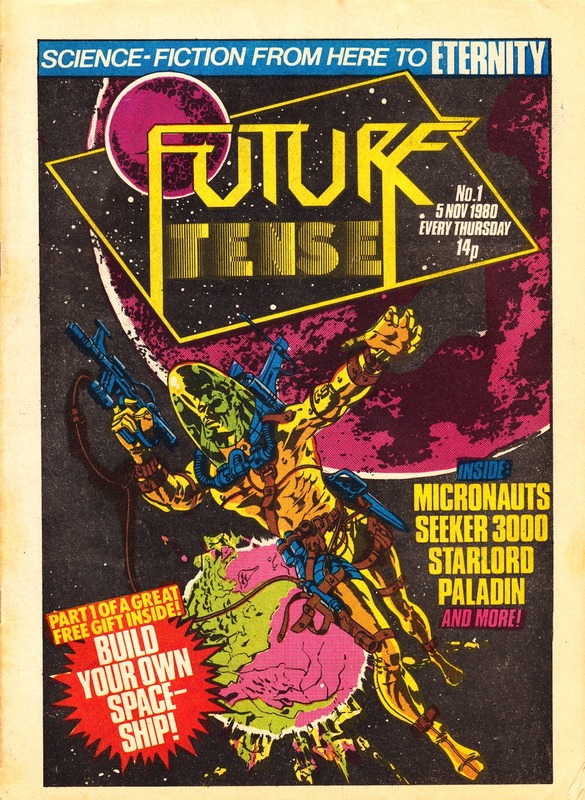 - VALOUR shuttered after only 19 issues and joined FT (to become the unwieldy FUTURE TENSE AND VALOUR) from issue 20, transferring Weirdworld and, M-UK mainstay, Conan the Barbarian. The SF weekly had morphed into an SF-Fantasy mix. - Although the toy-based Micronauts and ROM are often closely associated, FT was the only time that the two strips appeared simultaneously in the same comic. - The (ever-shrinking) Valour brand was eventually jettisoned, along with its strips, with issue 35 and FT became an SF monthly from the following week. The change was, presumably, in light of falling sales. The revised line-up featured ROM (until issue 38), Star Trek, The Micronauts and the Inhumans. - Although the more popular of the twin weeklies, FT didn't generate any official spin-offs (Marvel's STAR TREK specials were stand-alone one-shots) whilst Valour generated a Winter 1980 special. - Surprisingly, considering it absorbed two other comics, FT just faded away after cancellation with no official merger and none of the surviving strips transferred to another M-UK comic.